Our D’Iberville dealership has an impressive inventory of New, used, and certified pre-owned INFINITI vehicles. People coming from neighboring areas will be highly impressed by our service. Whether you’re looking for a used sedan, convertible or SUV, we have it on our lot. The selection of our used vehicles makes sure that our customers find something of their choice from it. Our staff is always ready to assist you in finding a vehicle suitable for your lifestyle. When searching for a reliable INFINITI service center, consider us. Our technicians have been handling these vehicles for years and know exactly what needs to be done, whatever the issue. We also have a part store that has quality products for your SUV, crossover, coupe or sedan. 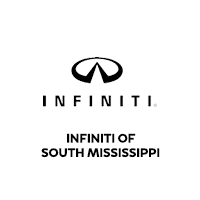 Not only D’Iberville, but neighboring drivers also bring their vehicle to INFINITI of South Mississippi. Check our contact us page, if you need any additional help in finding our location. Confused whether to buy or lease an INFINITI vehicle? Get in touch with our financing department and they will work out the best plan for you. Just fill in your information in the Payment Calculator and our finance staff will guide you further. Fill in the Finance Pre-Qualification Form or call us to learn more about this process and start it before you visit us. We are here to ensure you drive home in the vehicle you desire.